The critical factor that determines whether or not a sales team can actually hit their numbers in many mature B2B markets. How a relatively small sales team can keep close tabs on thousands of diverse accounts to make sure they aren't defecting. How individual sales reps can capture all of the potential growth opportunities buried within even massive books-of-business. How certain technologies can handle the heavy-lifting and free-up salespeoples' time to cultivate and acquire new customers. Relying on first-impressions, intuition, and gut-feel is just too risky when hiring salespeople today. This guide explores new options for infusing more objectivity and science into the process of finding good salespeople. Everything comes to a head when your sales team negotiates a deal. You want to win, but you don't want to leave money on the table. So, how do you help your sales team to become better negotiators, so they win the deals they should, at the right price? 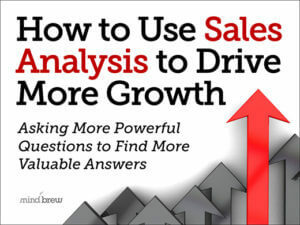 Sales analysis often has much more potential than it is given credit for. This on-demand webinar explains how to using the analytical processes and underlying data to reveal powerful insights and opportunities for growth.